I'm not sure if you noticed but I noticed that 100 years ago flying saucers were from mars . Later on they were from nearby galaxies and then as our understanding of the universe evolved they were interdimensional . Jacques Vallée also noticed that in medieval europe there were "flying ships" . Then after the industrial revolution there were dirigibles which were still ahead of our own technology . World war ll saw flying saucers and foo fighters . The phenomenon is changing and is always ahead of us technologically . WHY ?? Thanks Rusty2 for that vid. Very interesting ideas Vallee has with the ufo phenomenon. I often wondered why WW2 seemed to be beginning of all this. and the component of travelling lightyears is not that big a part of the story. I think those early sightings were described as being like airships because it was the only frame of reference people could draw from in those early days. Same with the old ‘they come from Mars’ explanation. They simply knew no better. There was no knowledge of any other planets existing beyond our Solar System. Now astronomers have discovered 100’s of new exoplanets and some scientists believe there could be a trillion more waiting to be found. Many would be earth like and residing in the so called ‘goldilocks zone’. NASA’s Kepler Space Telescope is dedicated to finding alien worlds. Just remember the analogy “there are more stars in the sky than grains of sand on every beach on earth". If that sounds awesome, Universe Today says it is more likely there are 5 to 10 times more stars than there are grains of sand on all the world’s beaches. The WW 11 Foo Fighters were generally described as ‘lights in the sky’ that followed the squadrons into battle. Similar lights are frequently reported today and make up many of the 600 odd sightings that are reported to MUFON every month. The understanding of inter-dimensional physics is growing. Remember how former Lockheed Skunkworks CEO Ben Rich famously said “we now have the technology to take ET home”. He also said words to the effect that this knowledge was locked up in black projects and would be unlikely to become public in the foreseeable future. According to Discovery Project founder Dr Steven Greer, alien beings are using a set of inter- dimensional physics very new to us to transverse the vast distances between stars. Let’s face it, the current chemical rockets are about as obsolete as button up boots when it comes to interstellar space travel. As for Jacques Vallee, Yes, he has a good reputation among researchers, but never forget he is a prolific writer. He comes up with a theory and writes a best seller about it. Cynical? Maybe. However, he has surely made a lot of money from his writings on the flying saucer phenomenon. I have mentioned before that I have met researchers like Stanton Friedman whose work I absolutely admire. He was bought to Australia for a national speaking tour by one of my entrepreneurial best mates. That happened not long after I convinced him of the reality of UFO’s. Again, excellent writers and speakers as they are, these are people who make a very good living from the UFO subject. And Tuckeroo, you are right to test if any lateral thinking theories make sense. That’s because not a lot else does compute in this fascinating field of incredible flying craft and their alien occupants. They have been reported to materialise in our atmosphere, so maybe you are on the right track. There could well be parallel universes all around us. I think the most important thing is to try and get a handle on the time frames involved. 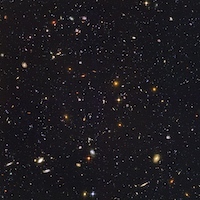 The Universe is 13.8 billion years old. Any of the visitors could be many millions or even a billion years ahead of the human race. We have had the capability of flight for around 120 years… and look how far we’ve come! Just image where we will be in a hundred, a thousand or even a million years!! The mind boggles. Of course that’s assuming our race can survive the test of time. Very interesting ideas Vallee has with the ufo phenomenon. It got me thinking , I'm not sure what to make of it now . I think those early sightings were described as being like airships because it was the only frame of reference people could draw from in those early days. That's a good point . However, he has surely made a lot of money from his writings on the flying saucer phenomenon. Yeah , everyones makin money out of it , here in Australia as well apparently . Sort of removes a bit of credibilty . I don't doubt for a moment Searcher that the universe is full of life and we're in a backwater so to speak and all the action is at the centre of the galaxy . I can't help but wonder though if it isn't what we think it is or what we'd like to think it is . The American indians have always known of visitors from other worlds and so do the Aboriginal people . I suppose many indigenous cultures know of the visitors . But is that what it is , Aliens ? Can anyone prove that extraterrestrials are visiting this planet ? Food for thought...... but are we dealing with aliens or something else entirely? There has been a definite deception going on for a while now not only from these entities themselves but also those here on earth. Is it deception or diversion ? Diverting peoples attention ? Or what is the deception ? Why are unknown aircraft (if that's what they are) flying around in the sky ? For what purpose ? To get our attention or divert our attention ? Can anyone prove that extraterrestrials are visiting this planet ? That’s unless you belong to the inner sanctums of the CIA, Skunkworks and perhaps NASA. Then you would have access the necessary proof. For me, it’s all about the weight of evidence… and there’s a veritable mountain of it! You just have to look and you will find positive indications from all over the world. If you put all the indicators together and see what I call the big picture, then common sense tells me ET is real and the governments within governments don’t want you to know. Why? Because then they would be forced to admit they have absolutely no control as to who or what comes and goes in our airspace. And that’s bad for business. The other reason to keep it secret is they have access to alien technology from downed and perhaps gifted craft and don’t want the world to know. Most Presidents are not ‘in the know’ as they are just politicians and don’t have the high level of security clearance required. I am convinced the Roswell crash was real. It is said there are over 200 witnesses to the crashed spacecraft, dead alien bodies and the one survivor. It is a fact that a number of small coffins were ordered by the military from the local Roswell mortuary. You could go into alien abductions and check out cases like Travis Walton and Betty and Barney Hill . It is clear as day that something remarkable happened to them and that it involved species of ET’s. There are 100’s of other cases worldwide that involve missing time. I have recently interviewed one in country Victoria. Logic also suggest aliens exist when you consider the humungous craft that flew over Phoenix in 1997and was watched by at least 10.000 people, including the Governor of Arizona. Any notion this low and slow flying, chevron shaped, completely silent mile wide object was secretly built and flown by earthlings is to say the least, nonsense! Also, listen to the Disclosure Project interviews from the National Press Club. If those eyewitness testimonies from high ranking ex Military and Intelligence officers don’t convince, then nothing will. Only a confirmed skeptic with extreme tunnel vision would dare call all those brave men and women outright liars. There are over 800 former government employed witnesses, all who are prepared to testify under oath to the US Congress as to what they know about the alien visitation. Below is a totally believable interview with a retired CIA agent who is close to death details the reality of aliens beings and the reaction of President Eisenhower when he found out about an ET at Area 51. The former General was going to invade the base with the First Army if he wasn’t shown the truth! Listen closely to all that is said and you won’t forget watching this remarkable 17 minute testimony. Not long after this, it is claimed the President had a secret meeting with an alien race at Holloman Air Force Base. There is a lot of evidence from ex military people who were present when it happened. Do the research, listen to the eyewitness accounts and make up your own mind. To my way of thinking, all of this evidence helps point to the reality of the alien visitation. Just my opinion, of course! Personally I have no doubt that aliens and UFOs are real , same as Yowies, Bigfoot etc are real. Perhaps some aliens ,UFOs,hairy persons are all related. I also believe that some UFOs/aliens are terrestrial in origin and some are extraterrestrial . All of this UFO,ALIEN information is suppressed/denied by governments same as they deny suppress the reality of hairy persons. We use reverse engineered alien technologies in our everyday life which come from the Roswell crash , such as computer chips , optic fibre, night vision goggles and Kevlar. It is reported that the USA government holds some 3,000 yet to be released patents of mostly reverse engineered technologies discovered over time down in Antartica under the ice. Medical and antigravity technologies are examples. Interesting youtube vid just released today which is relative to this thread/topic. Quite a mind bending video there, Black Stump! Also released today on the ABC News site is an article on the block universe theory, where time travel is possible but time passing is an illusion. Any budding theoretical physicists will get their heads right into this! There's never an easy answer to any mystery which is probably a good thing . Keeps us all guessing till someone makes that breakthrough . Seems TBS was on the right track! Just a few weeks ago on September 13th, the Daily Mirror published a report on the discovery of a mysterious base in Antartica. Google Earth shows a mile long line of 22 unknown structures plus what looks like a door to a very large entrance. Two of these structures appear to be emitting a red light. Check it out yourself. Simply copy and paste 75°00’46.98″ S 0°04’52.71″ E into your Google Earth search bar. What you have posted is a more recent disclosure. Over a number of years there has been many discoveries made by different countries mostly , under the ice , at many different locations around Antarctica. Nazis were supposed to be the first to discover stuff down there back in the 1930s/1940s. I was reading recently that over time Germany is responsible for about 80% of technological advances throughout the world.